The stylish Qatari rider Bassem Mohammed put in a masterclass of a round on the 12-year-old Hanoverian gelding Argelith Squid, by the Stakkato son Salito, to take top honours from the 28 starters in the five-star 1.45m table A class against the clock on the penultimate day of the spectacular Longines Global Champions Tour Miami Beach. Spectators enjoyed perfect weather and top sport under the Florida sun, with many in bikinis watching from the beach. There were eight clears over Italian designer Uliano Vezzani’s course, with the first attacking clear coming from Ireland’s Bertram Allan on Izzy by Picobello. Drawn third, they were the first pair to find the two inside lines on offer and broke the beam in 56.44 seconds. That round held top spot for the next 13 horses, with poles rolling in all corners of the stunning ocean-side arena. Home rider Kirsten Vanderveen (USA) came out of the start gate meaning business, hustling her nine-year-old mount (the equal youngest in the class) Bull Run’s Divine Fortune from the get-go. The mare by Padinus responded in tremendous style, quickening over the ground and stretching in the air. Their competitive round in 56.08 seconds rocketing them to a commanding spot at the top of them leaderboard — a performance that will surely give the 28-year-old rider a confidence boost ahead of tomorrow's LGCT Grand Prix qualifier. But the best was yet to come in this class, as Mohammed and Argelith Squid entered the sunlit ring. The pair showed a superb turn of speed, executing every turn in textbook fashion; the horse sharp and quick in the air, but responsive and with his ears pricked between fences. Their smooth, fast execution of the tricky turn after the skinny 1.45m oxer at fence eight to the double at fence nine was the clincher. The grey nine-year-old showed his extensive talent to extend and collect at the rider’s request, and they clocked a time of 55.91 seconds — 0.17 seconds faster than Vanderveen — and good enough to win the class and scoop the winner’s cheque. Some riders opted for slower, confidence-building clears, with Germany’s Holger Wulschner on BSC Skipper just missing out on the podium. Sergio Alvarez Moya (Iron Man), pathfinder Denis Lynch (RMF Cadeau de Muze), Olivier Philippaerts (Extra) and Abdel Said (Jumpy van de Hermitage) all posting clears. Great Britain’s Ben Maher was unlucky to pick up a single time fault on the nine-year-old Winning Good. The fastest four-fault round came from the in-form American rider Georgina Bloomberg riding Paola 233. 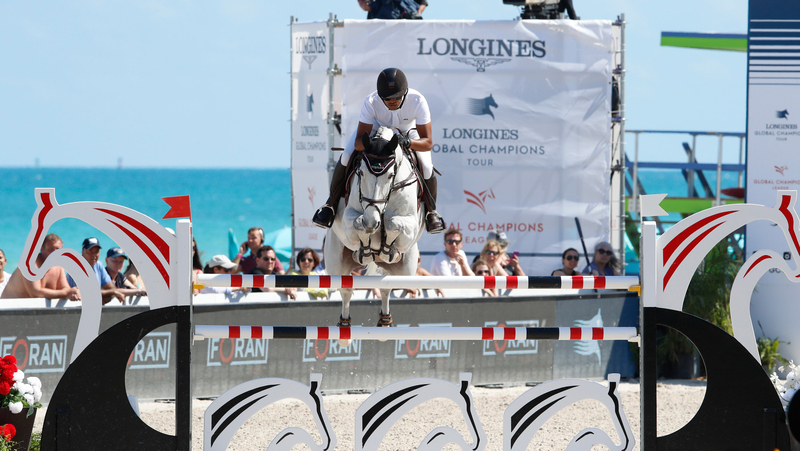 One more five-star class remains today — a 1.50m class with a jump-off — before the culmination of this spectacular show on Saturday, which sees the sport’s best riders face off for the Longines Global Champions Tour Grand Prix of Miami Beach.